unprecedented service at every level of the U.S. Army, Air Force, Navy, and Marines. For the first time in our military history, active duty, reservists, and guard servicemen and women have been required to complete multiple deployments. 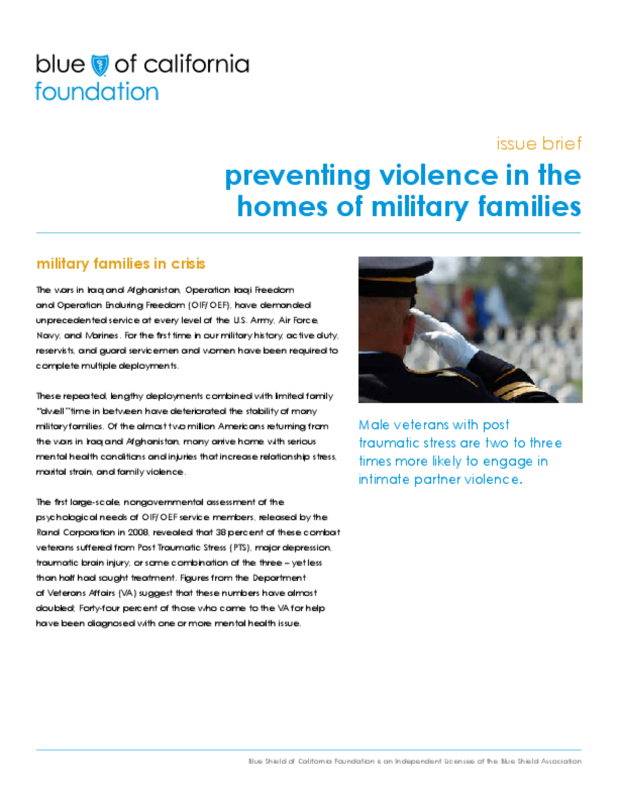 These repeated, lengthy deployments combined with limited family "dwell" time in between have deteriorated the stability of many military families. Of the almost two million Americans returning from the wars in Iraq and Afghanistan, many arrive home with serious mental health conditions and injuries that increase relationship stress, marital strain, and family violence. Male veterans with PTS are two to three times more likely to engage in intimate partner violence, compared to those without PTS -- up to six times higher than the general civilian population. 81% of veterans suffering from depression and PTS have engaged in at least one violent act against their partner in the past year. Over half of veterans with PTS performed one severe act of violence in the past year -- more than 14 times higher than the general civilian population. However, the confluence of domestic violence, Traumatic Brain Injury (TBI), PTS, and other mental health injuries among war veterans is by no means fully understood at this point, and requires greater analysis and investigation. Copyright 2013 Blue Shield of California Foundation.